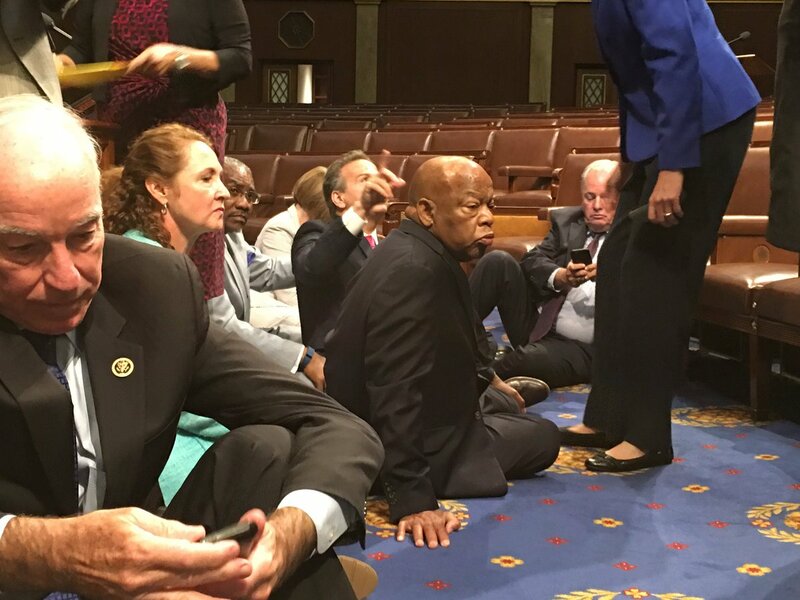 Democratic Individuality: John Lewis leads sit-in on House floor now - damn right! John Lewis leads sit-in on House floor now - damn right! On this issue and many others, it is time for the American people to fight back. Mass nonviolent civil disobedience in Washington and all over the country might force politicians to abandon vast unjust wars abroad, militarism (very hard...), and to acknowledge the fight for $15. This is a new time, and what John Lewis and others are doing right now, is promising. the time to get in the way. The time to act is now. We will be silent no more." floor of the House until there is action." dozen visitors in the gallery looked on. and tired!" and "No bill, no break!" Lewis later told NBC News that "sometimes you are moved by history." members, or to keep the House in recess and wait out the issue. streaming app, Periscope, to share footage of the sit-in. C-Span has been broadcasting Peters' video feed. press conference on the Capitol steps . vote, we would win the vote." policy reform was indeed televised. for African-Americans, took the Republican leadership by surprise. wake of the Orlando massacre. to be paralyzed by politics," Lewis wrote. gun policy Monday in the Senate. people on terrorist watch lists. Murphy, who led last week's 15-hour filibuster by Senate Democrats who demanded action on gun control, applauded the House's moves. So did former President Bill Clinton and President Barack Obama who in a Tweet thanked Lewis for "leading on gun violence where we need it most." Vice President Joe Biden called Lewis " the keeper of the nation's conscience at times of challenge and controversy." killed as a result of gun violence. no-fly list from buying guns. him an encouraging tweet today in a show of support. He later went on CNN, where he said he appreciated the president’s good will. Watch above to see Lewis tell Wolf Blitzer how long he and the rest of the Democrats plan to continue the sit-in.